ROB CORNEY went yet another step towards rewriting the Reading Roadrunners record books when he set a new mark of two hours, 27 minutes and 27 seconds at the Berlin Marathon. Already this season he had destroyed the old records at 5,000 metres, five miles, 10k (twice) and half-marathon. For his latest trick Rob (below) shaved 21 seconds off the previous marathon mark set by Keith Russell in Amsterdam five years ago. And on a great day for the club Keith was on hand to support his successor and break the news of his triumph with a post on our Facebook page. 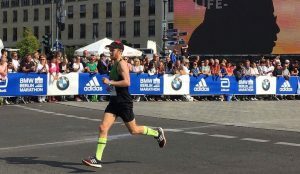 Second Roadrunner through the Brandenburg Gate, and also in a personal best, was Brendan Morris in 2:38:53, and there were also PBs for Sam Hammond, with 3:31.30, and Liz Atkinson, with 5:39.15. Sam took a massive 16 minutes off his previous best and Liz (pictured below) went one better with 17. Other Green Vests starring on the iconic German course were Gary Tuttle (3:07.29), Aaron Chai (3:27.45), Mark Andrew (3:28.18), Andy Atkinson (4:38.19), Colin Byers (4:58.54) and Anthony Eastaway (6:07.29). Having taken over seven minutes off his previous best set in Dusseldorf last year, Rob revealed the secret of his success. “I didn’t go into the race with Keith Russell’s record in mind,” he said. “I knew if I ran the splits I wanted I’d get it so I just put it to the back of my mind. “I target 1km splits in races. They come up pretty quickly so it’s easier to stay in control of your pace. The plan was to hit 3:30min/km. 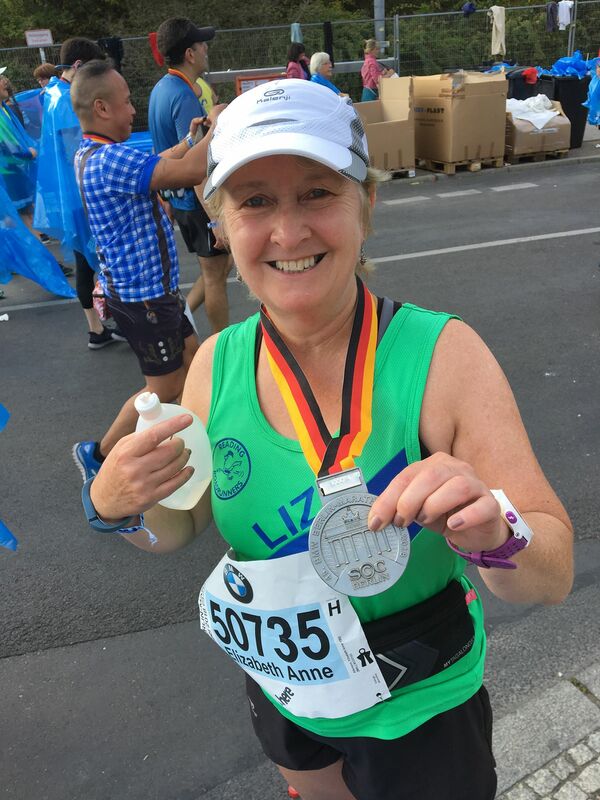 “Obviously the first 10k was slightly fast… no one needs negative splits anyway. I spotted Simon Goldsworthy (ex-Reading University) shortly after the start and crossed to run with him. We found ourselves in a nice little group going just above our target pace. “Just after halfway Simon started to ease ahead and I, being sensible for once, held back with the group. “As you can tell from my splits, 35-40k was a struggle and there were some pretty dark points where it was a battle to keep moving. But that’s why we run marathons, isn’t it? “I saw Simon again and passed him at about 39k as he was going through a low patch and I’d managed to pull myself together. “After that it was just a matter of trying to pick my feet up and run for the line. Former club men’s captain Keith said: “I have no mixed feelings about losing the record at all. Rob is a great guy who trains hard and is very supportive to everybody else so I was more than happy that he was the one to take my record. Meanwhile the tributes poured in from club-mates on social media and men’s captain Phil Reay said: “I’m running out of superlatives for Rob Corney. He’s re-written the club’s history books this year. His hard work and dedication have really paid off. “There were a couple of things from Berlin which really stand out and encapsulate the culture of the club and the good all-round people we have there. 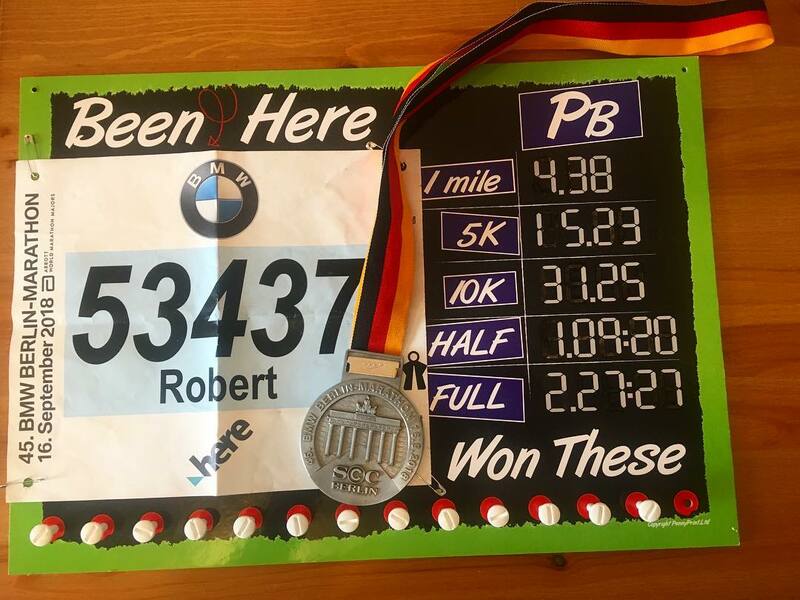 “Firstly that our previous club marathon record holder Keith Russell was in Berlin genuinely willing Rob on to break the record and was the person to break the news. So, what’s next for the club’s No.1 speedster after a year which has also seen him chalk personal bests at 15k, ten miles and parkrun as well as victory in a 60k ultra-marathon in Snowdonia? Immediate targets include a half-marathon in Sweden and he has an entry in the Abingdon Marathon on October 21st. By then, of course, the records books may have been rewritten again. I understand that Matt Richards, who was nine minutes quicker than Corney in the London Marathon in April, is confident of running a very good time in the Chicago Marathon on October 7th. And Mark Worringham, fresh from his 11th-place finish in the M40 marathon at the World Masters Championships in Malaga at the weekend, will be chasing another good time in the Chester Marathon on the same day. 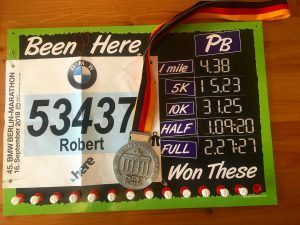 Posted in Dibben Report, July-Sep 18, Race Reports, Roadrunners18.